Labeling your new sport ‘ute “the GTI of compact SUV’sâ€ is a bit of a risk, especially today when we have all manner of super ‘utes lurking about with 400-plus horsepower V-8s under the hood. Being as the Tiguan and GTI share the same powerplant, it’s an easy connection to make, but it also bestows upon the car certain expectations. GTIs have long been the iconic compact car, praised for their particular blend of practicality, fuel economy, reasonable pricing and engaging dynamics. As such, one would expect the Tiguan to possess similar characteristics, albeit repackaged into a taller, more usable platform. Volkswagen’s bid into the compact SUV market may be a bit late, but given the Tiguan’s reception across the Atlantic – Germany’s Auto Bild Magazine voted it European SUV of the year in 2007 – it’s likely to see high demand in the North American Market as well, despite the fact that Volkswagen only plans to sell around 25,000 models per year. Good fuel economy is paired with a useful powerband thanks to the torque of the turbocharged engine. Sporty dynamics and acceleration that seem to defy the Tiguan’s dimensions are always on tap, and a 2,200-pound towing capacity, along with ample interior room, make it a remarkably usable vehicle. No TDI diesel engine, which offers dramatically increased fuel economy, will be available at launch or for the foreseeable future due to higher costs associated with diesel technology. The Tiguan carries an average base price above its mass-market Japanese competitors. With the front-wheel drive model weighing in at just under 3,400 lbs, the Tiguan is slim enough to shame most compact luxury sedans, not to mention SUVs. This low mass – just 300 lbs heavier than a GTI – is easily accelerated down the road by the 2.0-liter TSI direct injection turbocharged four cylinder. Lower weight also allows the Tiguan to change direction with remarkable agility thanks to marvelous steering that is stiffly weighted and has outstanding response for an electromechanical system. The command seating position feels like that of a larger SUV and the seats themselves are comfortable for long hauls, though strangely enough, the leather items don’t seem to be noticeably more comfortable than the cloth. The Tiguan’s ride quality luckily isn’t GTI stiff, exhibiting body roll in the turns, though not overly so. A 4-Motion all-wheel drive model is available, though unless you live in a truly trying climate, you’ll probably be fine with the front-wheel drive model, as the electronic stability allows the front tires to sniff out ample grip, even in light snow. The Tiguan is powered by the same 2.0-liter TSI turbocharged four-cylinder engine found in the Volkswagen GTI, Passat and Eos, as well as the Audi A3 and A4 just to name a few. Power is transmitted to the front wheels via either a 6-speed manual transmission or a 6-speed automatic with Tiptronic; unfortunately unlike the GTI, no DSG dual clutch auto is available. 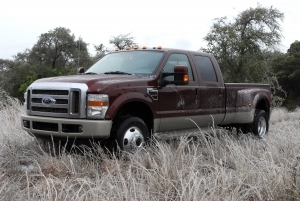 Optional 4-Motion all-wheel drive is available coupled to the six-speed auto, and the system uses a Halidex mechanical differential to split torque between the front and rear. The standard torque split is 90/10 front and rear, providing more compliant and predictable dynamics, though 100 percent of the torque can be sent rearward if needed. 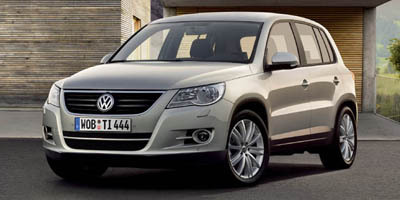 Three options packages are available for the Tiguan: S, SE and SEL. The S package, available only on front-wheel drive models, is relatively basic, adding 17-inch alloy wheels and a trailer hitch. The SE and SEL options add more robust, driver-friendly features such as a touch-screen navigation system with integrated hard drive, SD card reader and auxiliary input jack, as well as a backup camera and panoramic sunroof, which provides three times the exposure of a normal sunroof. Specing a navigation system for your Tiguan changes the dash layout to a somewhat better setup, replacing the single-zone climate control knobs with sturdier dual-zone items and swapping the stereo deck for a nav screen. Hard drive equipped Tiguans only use ten of their 30GB hard drives for navigation data, giving the driver the option of downloading music to the remaining 20GB via either the SD card reader or optical disc slot. The Tiguan also comes standard with ESP stability control, as do all Volkswagens, making the manufacturer one of the few in the world to offer ESP as standard on all models. Not only does the Tiguan’s 2.0-liter TSI engine qualify for a ULEV-II emissions rating, but paired with the SUV’s relative light weight, it adds up to quality fuel economy numbers across all available drivetrains. The front-wheel drive manual transmission yields an estimated 19 mpg city and 25 mpg highway, while the automatic front- and all-wheel drive models drop marginally to 18 mpg city and 24 mpg highway. Inside, the build quality of everything from the dash to the door panels is immediately apparent, and nothing feels budgeted or compromised. The controls follow a simple, utilitarian layout that doesn’t clutter up the dash or console. Rear legroom is ample even with 6-foot plus passengers in the front seats and abundant storage is on hand when needed thanks to sliding, fold-flat rear seats. Mini-Touareg would be one way to describe the Tiguan’s appearance, as it clearly draws various styling cues such as hood and rooflines from its big brother. Overall the Tiguan’s dimensions hide its interior depth, especially towards the back where very small rear side windows give the illusion of a limited storage area; but don’t worry, there’s actually plenty of space. The Tiguan enters at the upper range of compact SUVs, with a base MSRP of $23,200 for the S model. SE models, which Volkswagen anticipates will make up the majority of sales, are priced at $26,925 for front-wheel drive and $28,875 for 4-Motion. While these prices exceed those of Volkswagen’s key targets, the Honda CR-V and, to a lesser scale the Toyota RAV4, they significantly undercut higher-end competitors such as Land Rover’s LR2 and Acura’s RDX.